Ariana Afghan Airlines Co. Ltd. is the oldest and the national airline of Afghanistan, and is currently the largest Afghan airline, based in Kabul. The airline operates domestic and international passenger services. It is wholly-owned by the Afghan government, with its main base in Kabul International Airport. 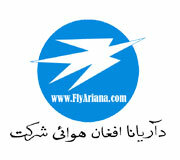 Ariana Afghan Airlines was established on January 27, 1955. During the 1970s, Ariana was considered a top notch airline company by many travel experts. At that time, the airline operated aircraft such as the Douglas DC-10s and Boeing 727s. Ariana was owned 49% by Pan Am and 51% by the Afghan government. After the withdrawal of the Soviet Union in 1989 and collapse of former president Najibulla`s communist government, the Taliban took over Kabul in 1996. Afghanistan faced substantial economic sanctions from the international sector during the Taliban regime. The sanctions, along with the Taliban government`s control of the company and the grounding of many of the carrier`s international flights, had a devastating effect on the economic health of the company through the 1990s. The fleet was reduced to only a handful of Russian and Ukrainian built An-26s, Yakovlev Yak-40s and three Boeing 727s, which were used on the longest domestic routes. In October 1996, Pakistan provided a temporary maintenance and operational base at Karachi. By 1999, Ariana flew only to Dubai, United Arab Emirates and Riyadh, Saudi Arabia; also, limited cargo flights continued into China`s western provinces. However, sanctions imposed by UN Security Council Resolution 1267 forced the airline company to suspend overseas operations. In November 2001, the airline was grounded completely. Following the removal of the Taliban by NATO forces in the wake of the September 11, 2001 Terrorist Attacks, Ariana began to rebuild its operations in December 2001. About a month later, the UN sanctions were finally lifted, permitting the airline to fly again. As a gesture of good-will and a step towards developing foreign relations with Afghanistan, the government of India gave the state carrier three ex-Air India Airbus A300s. Ariana resumed flights to international destinations, and its first international passenger flight since 1999 landed at Indira Gandhi International Airport in New Delhi, India. Boeing 727-200 5 Short - Medium haul 1 is operated for govt.